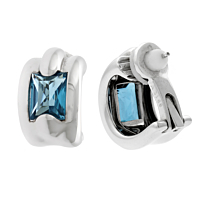 A bright and stylish pair of earrings from Audemars Piguet featuring blue topaz set in white gold. These Audemars Piguet blue topaz earrings fit the bill perfectly, whether you are having a romantic dinner or conducting a board meeting. Audemars Piguet jewelry has been defining the standard of quality and luxury for fine jewelry collections since the Swiss company was founded in 1875. The company has remained family owned ever since. Attention to every last exquisite detail is what sets Audemars Piguet apart from jewelers across the world. Selecting a piece from these gorgeous lines is truly a unique experience because the precious metals and stones incorporated into each design will transport you to a life of opulence. Whether you prefer gold or platinum, there are plenty of stunning options for you to choose from and elevate any look.